Bio: Bernard Louis Boutin (b. 1923), businessman, New Hampshire political figure, and government official was mayor of Laconia, New Hampshire, from 1955 to 1959, and a John F. Kennedy campaign worker in 1960. He was Deputy Administrator for the General Services Administration from 1961 to 1964, and Deputy Director of the Office of Economic Opportunity from 1965 to 1968. 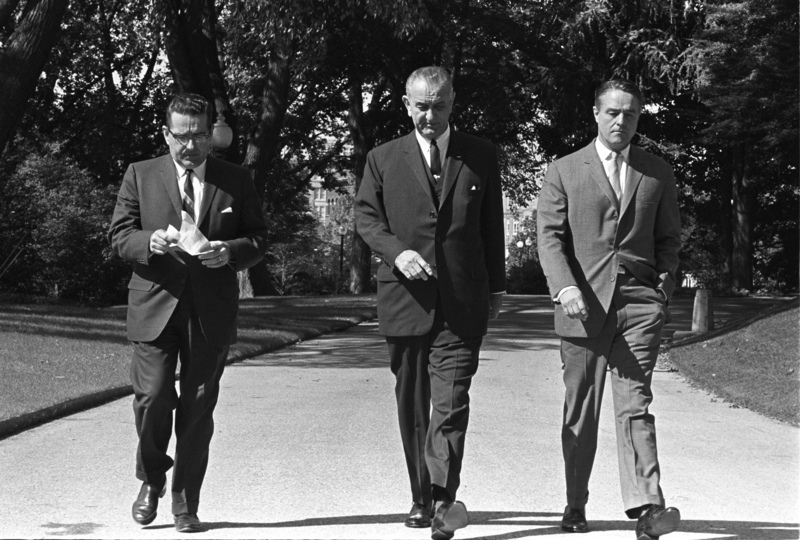 L-R: Bernard Boutin, Deputy Director, Office of Economic Opportunity; President Lyndon B. Johnson; Sargent Shriver, Director, Office of Economic Opportunity. South Grounds, White House, Washington DC, 24020. Photo # a1452-21 by Yoichi Okamoto. White House Photo Office collection, LBJ Presidential Library, public domain.